Two families live large and comfortably in this beautiful, self-sufficient prefab in rural Australia. Peacefully placed in an open field, Franklinford is more than just a pretty rural retreat. Completed by Australian–based prefab specialists Modscape, this energy-efficient 2,370-square-foot residence was constructed in just 12 weeks off-site, and effortlessly embodies the numerous benefits of prefabricated architecture. As with all homes prefabricated in Modscape’s factory, Franklinford was built with structural insulated panels for a highly insulated shell. 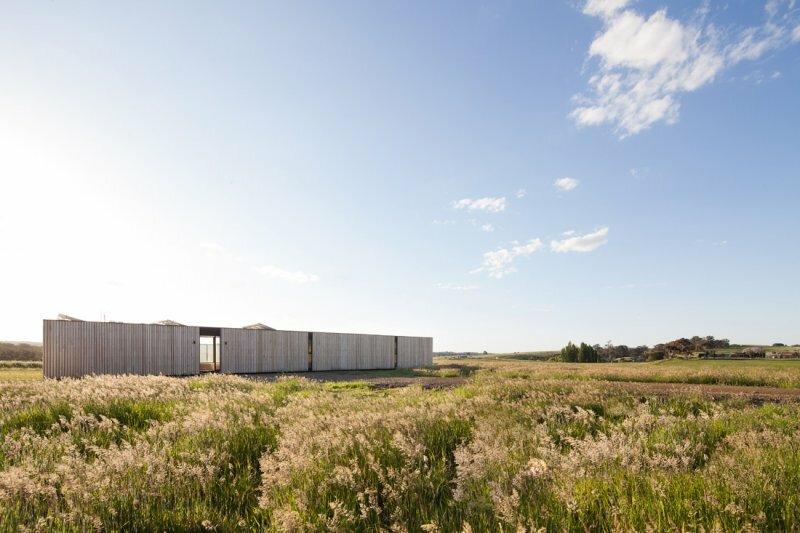 Radially sawn timber and batten covers nearly the entire length of the east façade to provide privacy from the road. In contrast, the west side opens to the outdoors with floor-to-ceiling glazing. COLORBOND® steel with Vitrabond accents clads the rest of the exterior in a nod to the local agricultural vernacular. Although the home was installed seamlessly on-site with a crane in as little as one day, it was the siting that proved to be more of a challenge. As Modscape managing director Jan Gyrn describes, the need to optimize passive design and maximize the property’s beautiful west-facing views took a lot of strategic planning. Despite the obstacles, the team appears to have succeeded in achieving their goals. Solar panels provide all the energy needed to power the off-grid rural home, and extended eaves—along with thermally broken, low-e double-glazed windows—mitigate unwanted summer solar heat gain. Full-height windows wrap around the home’s west-facing living wing to frame views of the rolling hills and a meandering creek. Sliding glass doors open to a north-facing, sun-drenched deck to further blur the line between indoor and outdoor living. Designed as a gathering space, the home accommodates two families thanks to the four bedrooms located in the private bedroom wing. A minimalist interior keeps the focus on the stellar rural landscape, and is aided by a light material palette that ensures a bright and modern feel. Whitewashed walls, white laminate joinery, and a marble-inspired Caesarstone benchtop provide a beautiful contrast against dark oak timber floors. The solar panel service system and storage are located in a nearby shed that also houses the 80,000-liter water tank.